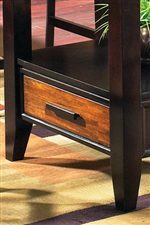 Combining the solid acacia tops with dark brown finished legs, this end table has a striking look to it. Featuring one storage drawer for your remote, reading glasses or papers. With the matching cocktail and sofa table you can complete a room in no time. 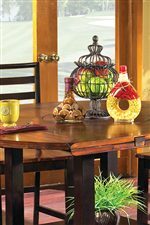 The Abaco End Table with Drawer by Steve Silver at Walker's Furniture in the Spokane, Kennewick, Tri-Cities, Wenatchee, Coeur D’Alene, Yakima, Walla Walla, Umatilla, Moses Lake area. Product availability may vary. Contact us for the most current availability on this product. 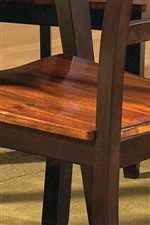 Wood & Finish Solid Acacia finished in a caramel coffee, with solid hardwood finished in deep brown.